If you’re seeking a large capacity and versatile cooking solution for your commercial kitchen, we have a deal for you! 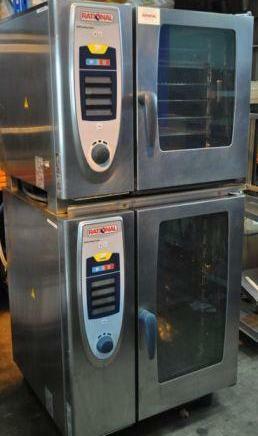 We’re offering a rare opportunity to purchase 2 stacked Rational Self Cook Centre combi ovens; one 10 grid, one 6 grid. Renowned for their intelligent combi technology, this Rational oven is equipped with an intuitive, simple to use display panel, and can roast, blanch, steam, poach, brown, and finish at the push of a button. Exceptional value for money, you will not be disappointed!